In our house, we love Tilapia recipes. The flavorful veggies in this tilapia dish are what really add that zing! 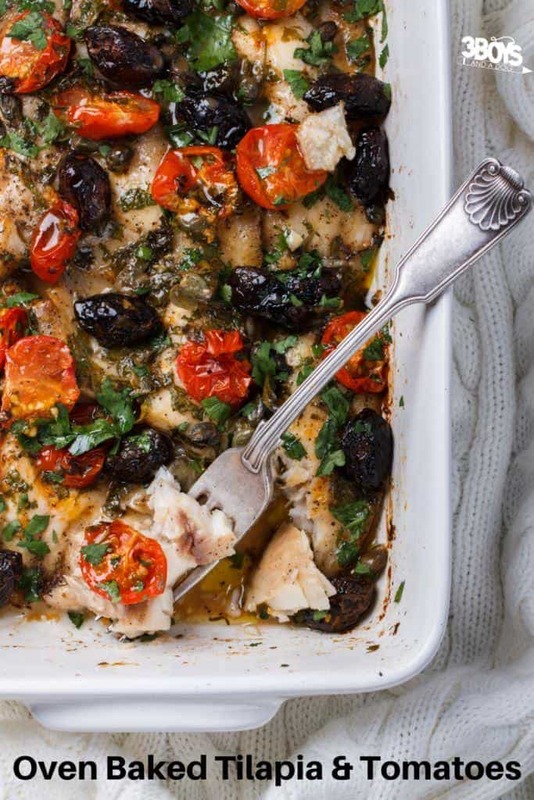 The combination of roasted vegetables, lemon juice, and olive oil in this Baked Tilapia with Tomatoes recipe creates a flavorful dish that is also healthy. We also like to substitute this fish for White Trout or Salmon on occasion, depending on the season. Best part? This recipe is only 3 Weight Watchers Freestyle points! The combination of roasted vegetables, lemon juice, and olive oil with the flaky, white, Tilapia fish creates a flavorful dish that is also healthy. 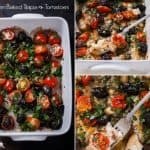 In a 9x13 deep baking dish, put 1 T olive oil, cut tomatoes, cut olives, rinsed capers, basil (reserve some for topping after cooked), and parsley (reserve some). 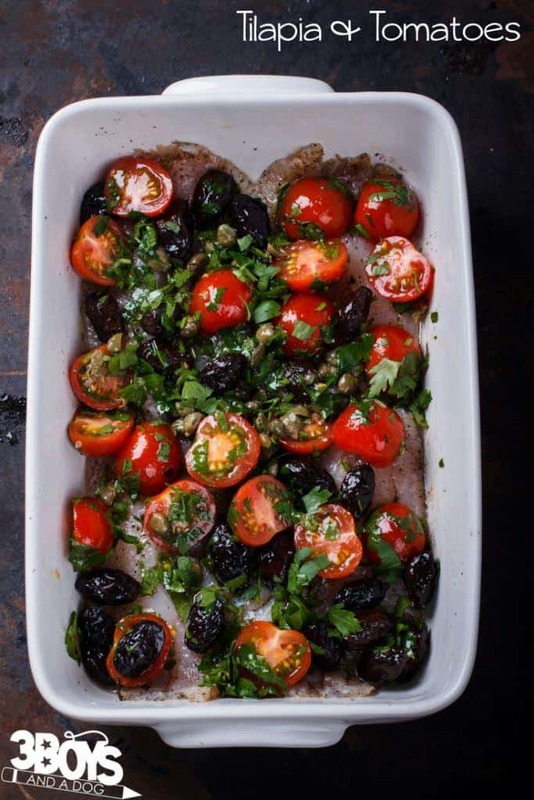 Remove roasted veggies from oven and move them to the side of the pan so that the Tilapia can rest directly on the bottom of the baking dish. Top the fish with the vegetables and pour the dresing on top. Bake for an additional 10-12 minutes or until the fish is done. Top with reserved basil and parsley. 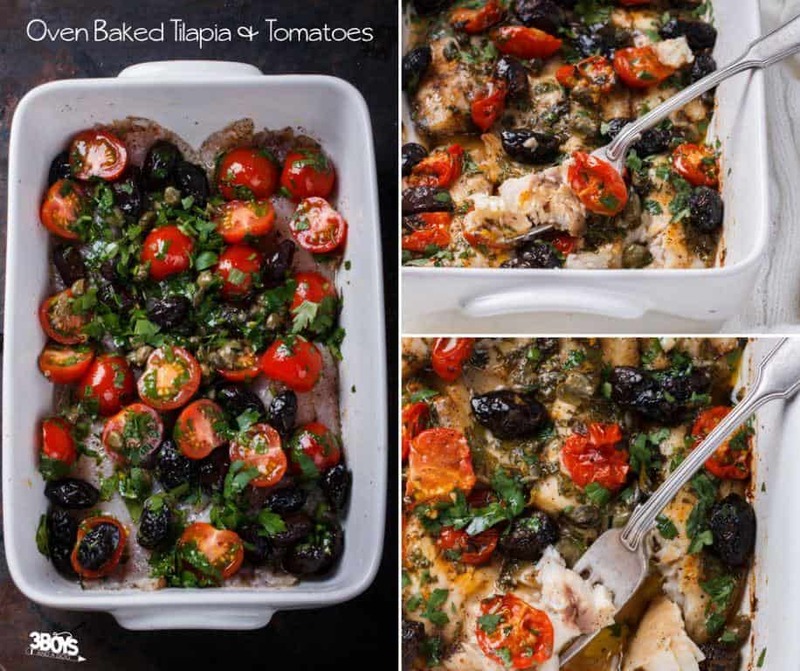 Great recipe for tilapia that is different from my usual, boring pan-sear! Will make soon! That sounds so good! I was thinking of making some cod tonight and wondering what I would do with it; going to check and see if I have these (or similar) ingredients to make tonight. PInned!